Description: La Plata River. French sea chart showing soudings between Argentina and Uruguay, also detailing Buenos Aires, Col Del Sacramento and the settlement that is now Montevideo. Coloured. Description: Early French city plan of Buenos Aires in Argentina. This diagram concentrates on the main buildings and churches. Coloured. Description: United Provinces of South America. Map surrounded by text describing History and Geography. Original colour. Description: La Rioja. 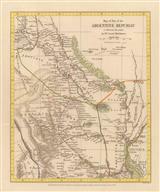 Detailed map of the region showing the routes of Messrs French, Gosselman and Hibbert. 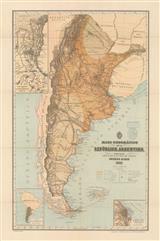 Description: Large scale map of the central part of South America, encompassing Argentina, Uruguay, Chile. Based on documents sent to Arrowsmith by Sir Woodbine Parish, noted diplomat and scientist. Original hand-colour. 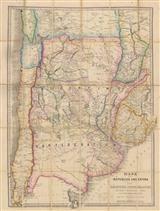 Description: Fine folding map of Argentina. The English title of the map refers to it as the Argentine Confederation, a name used for the region when the provinces were a confederation without a head of state between 1831-52. Original hand colour. Folded. Description: Provinces of Entre Rios and Cordova. Coloured. Description: Buenos Ayres to Chile. Projected Railway Route. Original colour. Description: Miniature map of Argentina alongside a view of Buenos Aires and a gaucho throwing a bola. Printed colour. 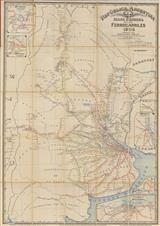 Description: Detailed map of the Railway systems across the Agrentine Republic, almost centring on Buenos Aires. Printed colour. 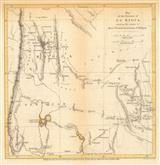 Description: Delta of the Rio Parana and mouth of the Rio del Plata with Buenos Aires and environs. 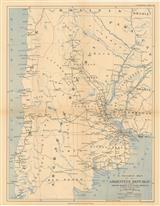 Description: Very rare separately issued folding map of the railway system of Argentina. Published by McCorquodale in London, it may have been issued to encourage emigration to Argentina. Original colour. Folded. Description: Separately issued folding wall map of Buenos Aires with a street index on the right. Printed colour. SL.